It’s that time again: A new big cat is upon us, and while it hasn’t brought about the rumored ‘Marble’ aesthetic, there’s been a lot of enhancements, tweaks, and improvements to the user interface and graphics of Mac OS X 10.6, commonly known as Snow Leopard. After a huge release like Leopard, which brought very radical change to the way our favorite OS looks, feels, and works, including a complete redesign of its icons and UI ‘theme’, Snow Leopard’s (incomplete) roundup of UI changes can only feel minor. Nevertheless, it shows some beautiful classroom examples of what composes true attention to detail. Since Snow Leopard has quite a few interface changes and tweaks, I’ve organized them into four sections. I’ll kick off with the most visible changes, and round the article up with (very) minor tweaks that are hardly noticeable, but show us that Apple still hasn’t lost its touch. 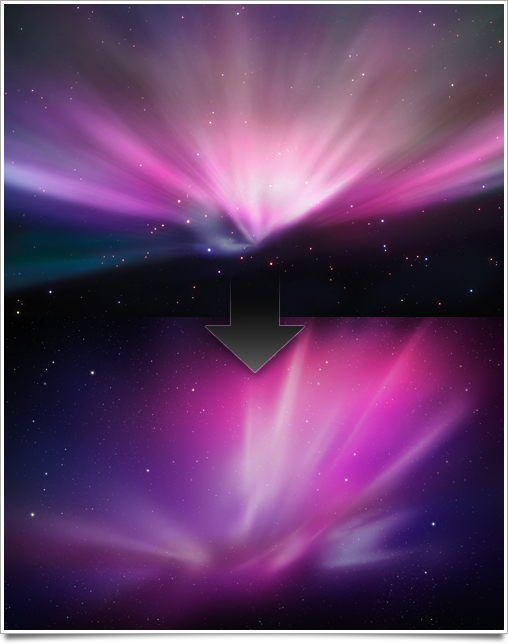 The most obvious change in Snow Leopard’s out-of-the-box appearance is the refined Aurora desktop background. I’ve seen a lot of people sticking with Aurora as their background of choice while Leopard was out, preferring it massively over the old ‘blue swooshes’ designs. Snow Leopard continues the pink/purple space theme, but refines it by making the whole a lot softer and with less interfering big stars. 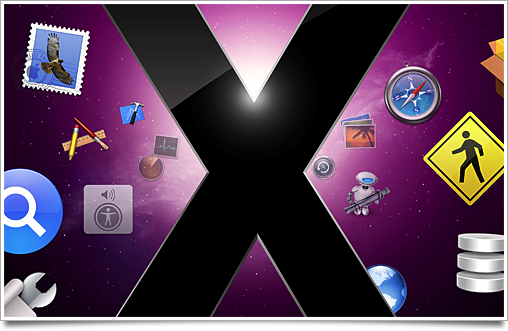 When Leopard first came out, there were a number of complaints about big shining stars in the background making menubar text illegible or making items in the Dock appear active. There’s about 10 bigger stars in the background now, and they’re all in the very middle section of the image. Overall, there’s more stars, lending the background a bit more detail and ‘realism’. The aurora itself also resembles actual Aurora Borealis much more. Apple has also been quick to update their own website with Macs using the correct desktop background image now, whereas upon the release of Leopard, most Macs on apple.com had the Tiger background showing. I really like being able to see an actual arrow in the small Time Machine icon now. Some icons, like the hard disk’s are unchanged, however. Perhaps they’re due for some pixel love in 10.7. Immediately apparent when using Snow Leopard are the Finder changes. Dragging to make a selection box on the desktop fades the box out neatly instead of just making it vanish. The same ‘fading’ effect happens with selected states of files and folders on the desktop. In the Finder itself, you can now browse through PDF files page-by-page, even at extreme 512 pixel icon sizes. The same goes for movies. I wonder why they are using the iPhone iPod app-style back arrow instead of a written ‘Back’. I assume it was done to save screen real estate, but iPhoto still uses ‘Back’ instead of an arrow. Speaking of Exposé, it’s been a huge update for one of my favorite features. The new Exposé lets you sort windows by name and application (try using ⌘+1 and ⌘+2 while in Exposé), has a ‘Quick Look’—like way of zooming in Windows, and finally makes file dragging behavior consistent. Previously, a user could drag a file into a folder, stack, or other filesystem element and make the element ‘spring’ open after keeping it held over its icon, allowing further navigation. This is now extended to whatever apps are running, allowing you to pick a window in Exposé after holding the file dragged over its dock icon. As you can see, the old method was slightly more economic, allowing you to see the window previews better and arranging windows quite arbitrarily. The new method is a bit more aesthetically pleasing and less organic. It also shows minimized windows. The first time I used Snow Leopard, I noticed a few other nice, but minor tweaks of the new big cat. 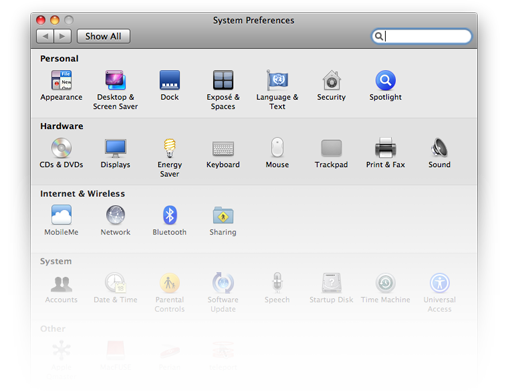 System Preferences introduces a whole set of new icons. The Energy Saver panel now features a power-efficient CFL lamp, instead of the old incandescent lamp icon, which is very nicely in line with what the icon is supposed to mean. The icons for Desktop & Screensaver, Time Machine, and Bluetooth were tweaked. Date and Time now gets a more polished Time Zone view, which can use the Core Location framework to estimate your location and automatically set your time zone (I’ve longed for this feature for a long time). There’s a funny crossover between the iPhone and Mac OS X in this panel, and it’s not just the framework that it uses to determine your location. Once determined, it drops a pin that’s exactly like the one you see in iPhone’s Maps app. 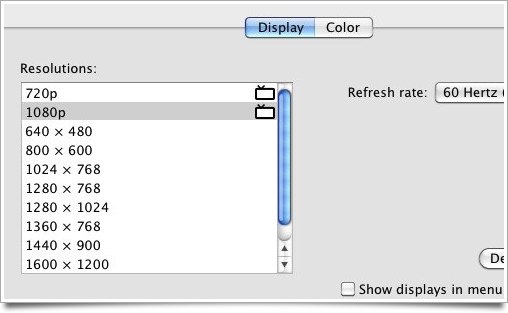 One of the other additions inside System Preferences is a separate set of resolution modes for connected (HD)TVs. The modes 480p, 720p, and 1080i/p are all indicated as TV output modes by a small, rather funny-looking TV icon next to them in the list. Preview has received a large amount of feature love, and shows off some neat Core Animation tricks. Viewing a multi-page PDF enables a sidebar that offers an overview of the pages, which has a ‘booklet’ icon at the top that can be clicked to collapse the pages. While collapsing, the booklet cover neatly folds over the contents. I love the update of the Wi-Fi menu item as well. When connecting, the menubar item now animates the waves in the AirPort logo pulsing outward, and shows signal strengths in the list of access points. Resolution independence, a feature touted since a few WWDC’s ago, has gone back a few steps and is now quite broken. This is most likely due to private ‘theme’ format changes (moving away from the old SArtfile.bin and towards CoreUI). Thanks to John Siracusa and his extensive review of Snow Leopard for pointing this out. Something exploded when Apple first introduced the Safari 4 beta. In fact, what happened is a great way to illustrate to a casual computer user how difficult designing a user interface really is. Apple took our tabs and put them in the titlebar. An internet outrage erupted. Every Mac-related news website and forum started filling up with discussions about the Little Tabs That Could (or couldn’t, depending on the person behind the Mac). Then, when I was just settling into being a fully self-proclaimed ‘tabs-on-top’ guy, I installed the WWDC Snow Leopard seed and heard my jaw make a cracking sound as it dropped on the hardwood floor. Oh dear. In the end, Apple did something very unlike them. Buckling to the large amount of negative feedback, they moved Safari 4′s tabs back to the ‘right’ place: between the toolbar and the webpage. They’ve also shown care to the minor details, as is evident by the replacement of the kludgy ‘Tabs’ preference section icon which I complained about in my Safari 4 UI breakdown. QuickTime X has received so many changes it requires a section of its own. I think most of you will be aware of the big changes, like its compact window mode and new controller look (which appear in iTunes 9 as well), but there’s some smaller changes that are very nice to expose. I really like the new controller look. It shares some of its traits with the (hey, we were first!) doubleTwist movie controller. Nice and crisp. There’s also a new application icon. 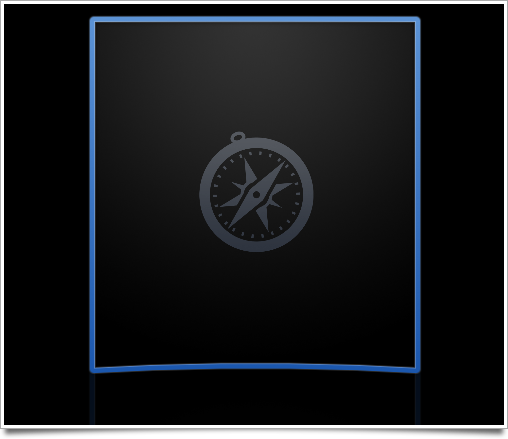 Originally shown off at WWDC with a pinkish hue, it was recolored to be blue like the old QuickTime icon. It hasn’t been updated on Apple’s website yet, but Snow Leopard does ship with the new icon. More interesting is the new QuickTime Safari plugin appearance. The old one was dated by all means, and while I think that it’s not so aesthetically pleasing, it does a lot of things right. First off, it hides, like the regular controller, when you don’t need it, and it foregoes the confusing old collection of arrows. The neatest thing about that little plugin player has to be seen with your own eyes, though. The ‘scrubber’ knob of the player actually crawls along ‘between the pixels’. In other words, it’s being drawn in code and shows progression even when the allotted amount of pixels that make up the progress bar doesn’t allow moving the playhead as far as one pixel. This is something you see pretty frequently with longer videos. The playhead would just sort of ‘stick’ to a spot until it could progress a pixel further to the right. Instead, it intelligently draws the knob in a way that shows progression without moving the entire thing one pixel. If that’s not attention to detail, I don’t know what is. My compliments to the design and engineering teams at Apple for making Snow Leopard a solid release. As usual, if you spot noteworthy changes not featured here, let me know in the comments! I was already waiting for the new roundup! Quite a lot more changes than I’d noticed, thanks for the great writeup. I just love reading these! What I didn’t expect was that I actually learned of features that I didn’t know about (sorting and Quick Look in Exposé). I really like the way iTunes 9 looks. It was quite a shock actually. A lot of changes in a lot of places. The kind of changes you like to post. I’d love to read an article on this. When Leopard was released, I felt the wallpaper was saturated and really strong. Now it looks quite pale compared to the new one. I’m glad they also “fixed” the issue with the bright starts. I noticed it on a friend’s 20″ iMac when running iTunes (I’ve also read about it on some blog). 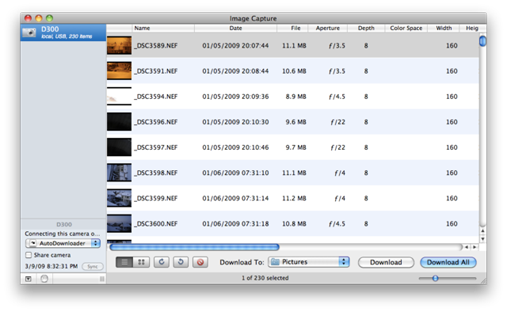 The chapter selector on Quicktime files is a nice improvement. You get visual thumbnails instead of just a textual list. The Energy Saver icon is not new to Snow Leopard. Leopard has had it for some time now – though not in 10.5.0. Great round up, thanks. One correction: the power-efficient CFL lamp for the Energy Saver prefs has been there since 10.5 though I’m not sure in which point release it appeared. Nice roundup of Snow Leopard. I know some people have some complaints with the new iTunes 9 interface but I for one, *love* it. The sidebar icons have made a major improvement as well. I’m interested to know how you feel about the changes to Exposé. I’m finding it very hard to visually diagnose which window is which, since everything scales to roughly the same size. The windows also tend to move far away, in their exposed state, from where they reside in full. The icing on the cake would have to be that your keystrokes apply to the previous window for a second or so, when switching via exposé. I keep closing documents and applications in the background quite by accident. Thanks for sharing the subpixel scrubber tidbit, by the way! In any case, Quicktime X has a very long way to go before it can match the functionality of Pro 7. Fantastic roundup as always. I love both the attention to detail from Apple and their UI designers as well as the care you put into the images and overall design of posts like these. With regards to the energy efficient lamp, I believe Leopard included (and continued to include) the standard bulb icon, but when the unibody MacBooks started shipping, Apple included the new icon on those machines to represent the hardware teams’ greater focus on the environment. I guess with Snow Leopard they felt every Mac suddenly deserved such green credentials. Try to install second keyboard language and switch between them with shortcut (default cmd+space I think). Now just hold cmd key and you’ll see nice on-screen display. BTW, why no word on dock context menus? There’s a very nasty bug in the new QuickTime UI when you click on one of the volume icons. Also, when you click on the remaining time while watching a video, it moves a few pixels. My Mac mini had the new Energy Saver icon in Leopard. It switched in one of the point releases. Not just for MacBooks. I’m not sure if you mentioned this, but if you chang the way icons are arranged on the desktop the icons will slide around to rearrange themselves. In a nice change, the resolutions list in Display preferences uses the correct ‘×’ character instead of the letter ‘x’. Another correction: The Safari 4 changes were made when Safari 4 was initially released. They are no (noticeable) changes to Safari in Snow Leopard. The Energy Saver icon changed from an incandescent bulb to a compact fluorescent in a Leopard software update; this is not new in Show Leopard. 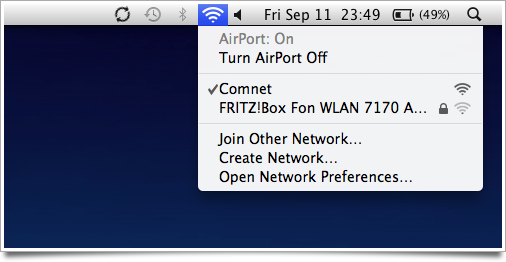 The AirPort signal strength indicators in the menu aren’t new, either. And now they have a cool new seemingly coca UI. - When you adjust the colour of an image in Preview there no longer is any option to set the white/black point as there was before. - The new global choice to search the local folder doesn’t seem to always apply when you are in an open/save dialogue. Question: Something I assumed Apple would change in Snow Leopard, but apparently haven’t, is to standardize the scrollbar style across the operating system. Why does Safari, Finder, and nearly every other app still use Aqua style scrollbars? But iLife ’09 apps, and iTunes use a (seemingly more appropriate) flat blue scrollbar? Just strange to me that something so blatant wouldn’t be standardized. The Aqua scrollbars must be near the only visual element that hasn’t been deprecated since OS 10.1. Too bad thy didn’t address my favorite gripe with the Safari tabs. They are below the toolbar (good) but have lost the pixel or two of darker grey between the tab and the webpage in Safari 4. Now, Apple, bring those back too, please! Oh, and search.cocoia.com is really cool! The menu icon for the input menu is no longer in color. In leopard it would display the flag of the language in color. Now it is black, matching all other icons in the menu bar. 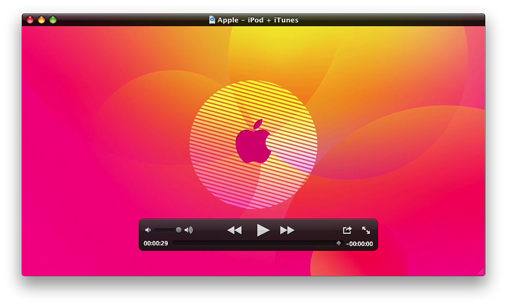 I agree with Wittevrongel, I would love to see an iTunes 9 Roundup. Re: QT embeds: I must say I think the dynamic scrubber *looks* like it’s a bug more than a feature. It changes width and shape as it progresses down the line. When it’s a fixed image it feels like a stable part of the UI I can grab. Exposé’s selection style and Safari’s selection style are entirely different beasts. Yes, they use the same color, but Exposé’s is some sort of blurred glow, entirely unlike the detail apparent in the Top Sites (and iTunes 9) selection band. The thing I keep finding myself playing with is the toggle between the “full” Finder window and the “lite” Finder window (not sure what their technical names are) that you get by clicking the “pill” button in the upper right hand corner of the Finder window. That’s some pretty slick animation! My only complaint about the Snow Leopard UI is that they changed the way 4-finger gestures work. In Leopard I could drag 4 fingers down to launch Exposé, hold them there, then drag them back up to go back to my last window. This was a nice way to take a quick glance at other windows. Same with the 4-up-gesture to show the Desktop; I could drag up, then drag back down when I was done. They changed this scheme in Snow Leopard. If you drag 4 fingers down to launch Exposé, you have to drag them down again to close it, which is the opposite of the Leopard behavior (incidentally, if you drag them up Exposé will briefly close and then open again, which is bizarre). The 4-finger-up gesture works this way too; this behavior feels really bizarre to me. The old system felt perfect. I can’t believe that the Snow Leopard QuickTime Safari plugin still hasn’t a full screen option. The Annotation-feature in Preview have been given an overhaul as well with the inclusion of a new toolbar-icon and a new bottom panel with various annotation-options. I’m very suprised that you don’t mention the big, ugly new blue glow that surrounds highlighted windows in Exposé. This not only clashes with the theatre spotlight effect on Dock icons during application Exposé, but also is another example on how Apple completely ignores the user set highlight color from the System Settings. James Gill, I have a non-unibody MacBook Pro and have the CFL icon, so I believe Ben Artin is correct that this was included in a standard Leopard update at some point. I’m not sure about the changes to Exposé either – I love how minimized windows are shown, but I think making each and every window the same size is confusing. I liked the new Image Capture –– how would you have redesigned it? and a note just to say yeah the Energy Saver icon was introduced with the late-2008 MacBook Pros; but everyone got them with the 10.5.7 update (http://discussions.apple.com/thread.jspa?messageID=9483222). The new Exposé Tiling might *look* better, but it makes Exposé completely useless to me. 10.5 Exposé tried to keep relative positions as much as possible, which meant that if one was looking at a window in the background, and activated Exposé, that window would still be where one’s eyes were, but now as a much larger hit target. The same goes for if one knew the position of a window even if it was obscured. I work with a *lot* of windows when I code, yet know pretty well where they are, as I’m a visual thinker. I used to be able to know exactly where to look for a window when I Exposé’d. With the new Exposé, the window thumbnail might move to a very unexpected location at the other side of the screen, just to align nicely in a grid. I filed a radar, but just got a rude response and the ticket was closed. Nice roundup! I can’t resist to mention that the Energy Saver icon was changed to a power-efficient lamp already at 10.5.x. I can’t remember which version it was but I alreade have it and I haven’t upgraded yet (damn Apple is out of DVDs where I live). Took the time to read the comments and found out the lamp thing was already mentioned. Oh well. I think, the programmer who has done this was told to do the preferences for Quicktime X, when he’s ready with the knob. Is it just me or does the time machine widget at the top look grey and/or thin compared to Leopard? 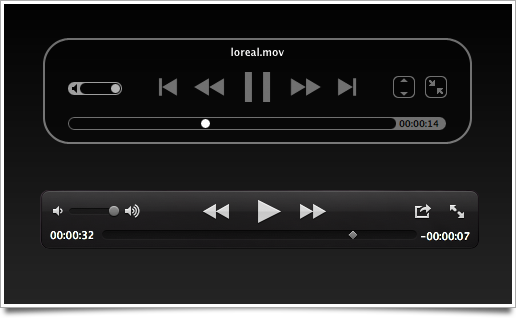 I was annoyed to find that Quicktime X lost the audio/video controls that were in QT 7. I’ve never seen it mentioned before, but in the Finder (in Icon view) m4v files that have cover art now show that for a thumbnail instead of the first frame of the movie like it used to. My Finder window suddenly looks like iTunes. In fact it’s even worse – it’s *one* of Apple’s ways or no way. I can’t believe they don’t let the user choose. Having tabs on top in Safari or use the old arrangement style in Exposé should be up to the user to choose! Can imagine you got a rude response in Radar. I filed a ”bug” for the apps switcher in Leopard that you couldn’t use arrow keys left/right to ”go around” to the other “side”. Got reply ”it’s by design”…. At least in Snow Leopard they’ve added so a second left/right key press att the end of the app switcher gets you to the other side. >Can imagine you got a rude response in Radar. because it’s not a bug but a feature request. I’m serious. here, apple choose to not keep the old expose mode (I loved it) , it’s not a bug. You can ask to add an option to have the old mode, it’s a feature, but it’s not what radar is. It’s why they are “rude”. They are simply strict. nothing personal I’m sure. There’s now a little arrow beside print jobs in the print queue. When you click it, you get a preview of that print job. In a Finder window, if you click the widget top right to show/hide the side bar and icon strip, the window animates as it changes instead of just changing quickly as it did in Leopard. Another tiny change, but the effect of the rewrite in Cocoa. Great, as you always do. It would be nice a post about iTunes 9 new (controversial) interface. FINALLY I THOUGHT I WAS GOING CRAZY WHEN NO ONE BELIEVED THAT THERE WAS A NEW WALLPAPER FOR THE AURORA WALLPAPER THEY ALL SAID IT WAS SAME, BUT NOOOOOOOOOOOOOOOOOOOOOOOOOOOOOOOOOO. Why the iPod touch G3 Camera was Yanked, and Rightly So. Merita sau nu?